Subspecialties: Ankle arthroscopy, Ankle arthroplasty (ankle replacement), sports traumatology, treatment and/or surgery of cuboid syndrome, joint dislocations, Achilles tendon rapture, Achilles tendinitis, Neuropathic arthropathy, Morton’s neuroma , Metatarsalgia. Years of experience and number of successful surgeries: Some 15 years of experience In orthopedic, arthroscopy and arthroplasty procedures and more than 8,000 successful surgeries. Born in 1974, Dr Naderi earned his high school diploma in 1992 with a GPA of 19.17 out of 20. He then participated in the Iranian University Entrance Exam, known as Konkour, and obtained an excellent position in the ranking (64th in Region 1) which allowed him to be accepted at Mashhad University of Medical Sciences to study medicine. In 1999, Dr Naderi was graduated in general medicine from the university with top scores. He participated in a PhD exam the same year and was accepted at Iran University of Medical Sciences. He successfully completed his residency in orthopedics at this university in 2003 after which he also received his board certification in this specialty. 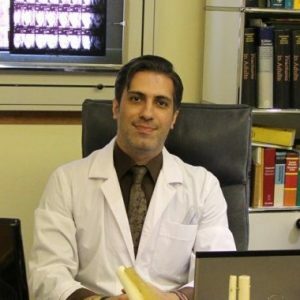 Dr Naderi did his national service as an orthopedist at the Iranian Navy’s Golestan Hospital between 2003 to 2005 and did his compulsory medical service (Tarh) between 2005 to 2012 in Semnan province. It was during this period that Dr Naderi performed his first arthroscopic surgeries. In 2012, Dr Naderi began his work in Naft, Treata, Ibn Sina, Moheb and Mehr hospitals, as well as the Sports Medicine Federation of Iran. Fellowship of Ankle Surgery in McGill University of Canada under the guidance of Dr Ruth Chaytor.